Let your registered contacts rapidly know your status and potentially your location in the event of an earthquake hitting. Check on the status of your registered contacts in the event of an earthquake hitting. Store up to 500,000 earthquakes offline. Search these saved earthquakes with ease and see their location on a global map and detailed information relating to them. Download historical earthquakes that have been missed. Use a stepper time control on the map to see how the selected quake relates to others in the quake time line. Driving back to Wellington one Sunday evening after a weekend away, we were listening to the radio, when the program was interrupted with a news flash that Wellington* had been hit by a 6.4 magnitude earthquake. The first thing we thought of was: Do we really want to go back to Wellington that night? The second thing we thought of was: Start texting friends to ensure that they were OK. After a few texts, boredom and thumb strain set in, and it struck me that it would sort of useful to have an app that would automatically text one's contacts in the event of a suitably large earthquake. A 'Please help (me)' type of message including the latitude and longitude could be used, to ensure that ones friends actually called back to see if one was ok, and if one wasn't, at least they would have a latitude and longitude to start looking for one. That seemed a bit over the top for the 99.9% of the time that one wouldn't be incapacitated by a collapsing building, so the ability to send an 'I'm Ok' or an '(Are) You Ok', as opposed to a help request, message would also be useful to send one's contacts. 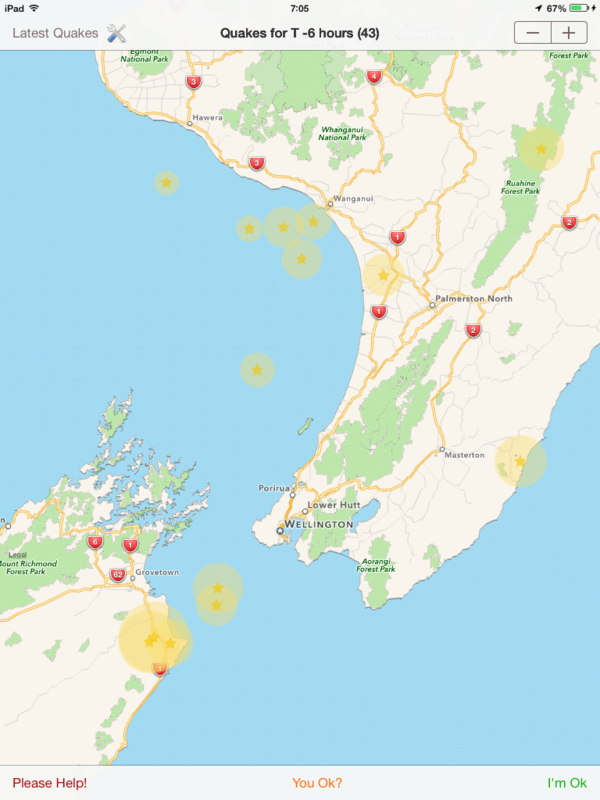 The user can navigate into these results to see the location of the earthquake on a map view. They can further navigate to get finer details on each earthquake, and ultimately can view the quake in the originators site if required. A time control on the map allows the user to see how the current earthquake relates to previous and future earthquakes in the time line. The earthquakes can be searched by feed (GNS, USGS, EMSC, BGS and JMA), magnitude, depth, date and distance to quake from the user's current location to limit the results displayed. 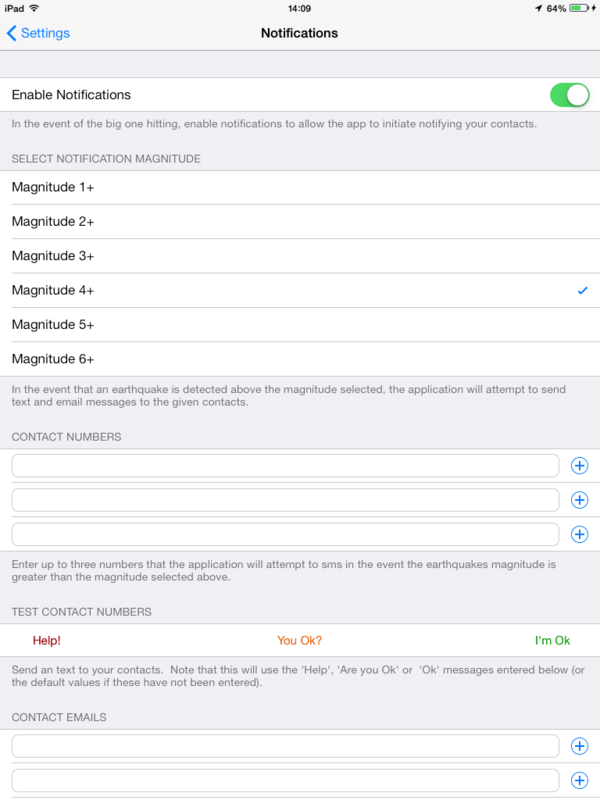 The user can set up the application, so that in the event an earthquake above a certain magnitude occurs, the application will attempt to rapidly prompt the user through the iOS SMS and Email systems to send either a 'Please Help (me)' request , or an 'I'm ok' confirmation notification messages to the user's registered contacts. The user has the option of sending their location in the help request, to aid with their rescue. The user can register notification contacts via their address book or by free form text. In the event that the user feels the earthquake before being prompted by the application, the user can choose to trigger the sending of the the 'Please Help' (me), 'You Ok?' or 'I'm Ok' notifications themselves. Note that the notion of sending a help request with location coordinates does not have to be confined to an earthquake scenario. Twisting an ankle while out on a hike would be an example. You do want your friends to come and give you a hand, but you don't necessarily want all branches of the emergency services involved in a full blown search & rescue effort. * Actually it was Seddon that got hammered, but as this didn't fit in with the Kiwi collective psyche's dream of Wellington getting flattened by 'The Big One', it took a while for that to be acknowledged. 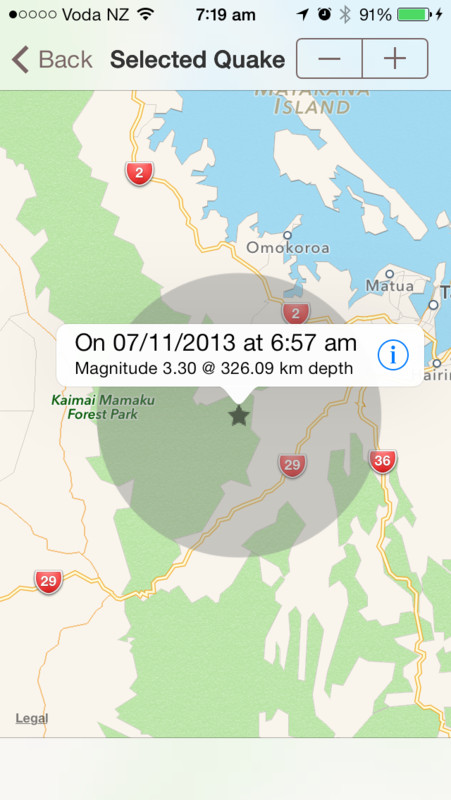 Navigate to 'Settings' > 'Quake Management'. Select either GNS or USGS as the primary quake feed. What this means is that Terris will use this feed to determine when to trigger 'Please Help (me)' requests. Note that when the primary feed is selected, that feed is also selected in the 'Active Quake Feeds' section. Primary feeds cannot be deactivated in the 'Active Quake Feeds'. Use the 'Active Quake Feeds' to determine which feeds you want to follow. Unless you have mobile data restrictions or really do not want the non-primary feed, select both. Scroll down to the 'Refresh Interval' section and select the 'Every minute' option. This means that if the device is connected to a WIFI network or has mobile data enabled, Terris will check for new quakes every minute. Navigate to 'Settings' > 'Setup Notifications'. Ensure 'Enable Notifications' is switched on. If it is switched off, Terris won't try to trigger 'Please Help (me)' requests. 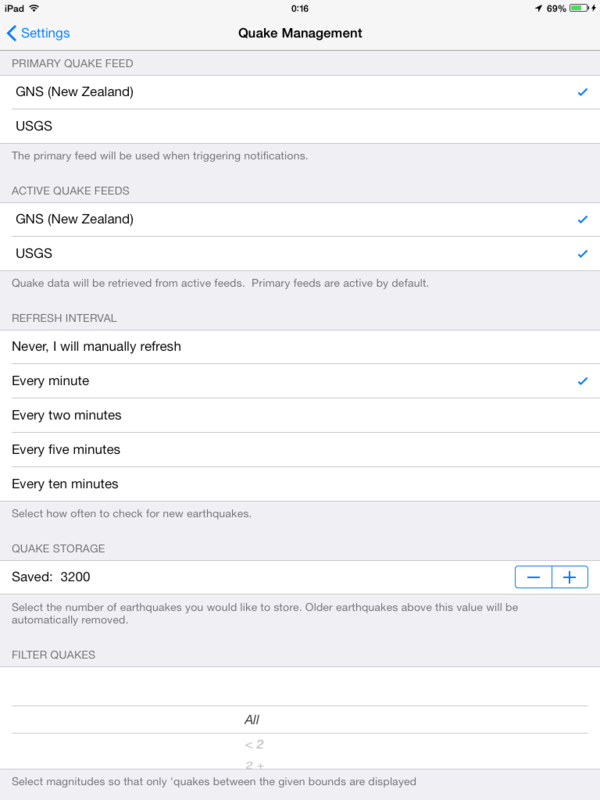 Note that 'Primary Quake Feed' appears in both 'Quake Management' and 'Setup Notifications'. This is so that users can easily change the feed that triggers notifications, without having to navigate back to the 'Quake Management' menu. 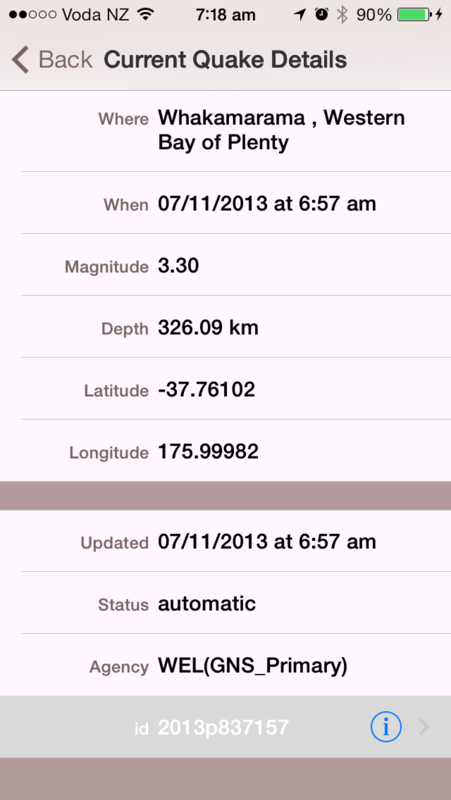 Scroll down to the 'Select Notification Magnitude', and select 'Magnitude 1+'. This means if Terris comes across a magnitude 1 or greater earthquake on the primary feed, it will trigger a 'Please Help (me)' request sequence. Scroll down to the 'Contact Numbers' section. Either enter a number free hand, or use the 'add' button to add a contact number via an address book lookup. Note that with the address book lookup, only numbers that are tagged as being 'mobile' numbers are selectable. Scroll down to the 'Contact Emails' section, and like 'Contact Numbers', either enter an email by freehand, or use the 'add' button to add a contact email address via an address book lookup. Note that you can test both the contact numbers and contact emails by using the given test buttons. These will display (and send if required) the messages that will be sent to your registered contacts. Scroll down past the 'Help Message', 'Are you OK Message' and 'Ok Message' sections. Note that these have default messages that you, the user can modify. Scroll down to 'Enable Location Updates'. 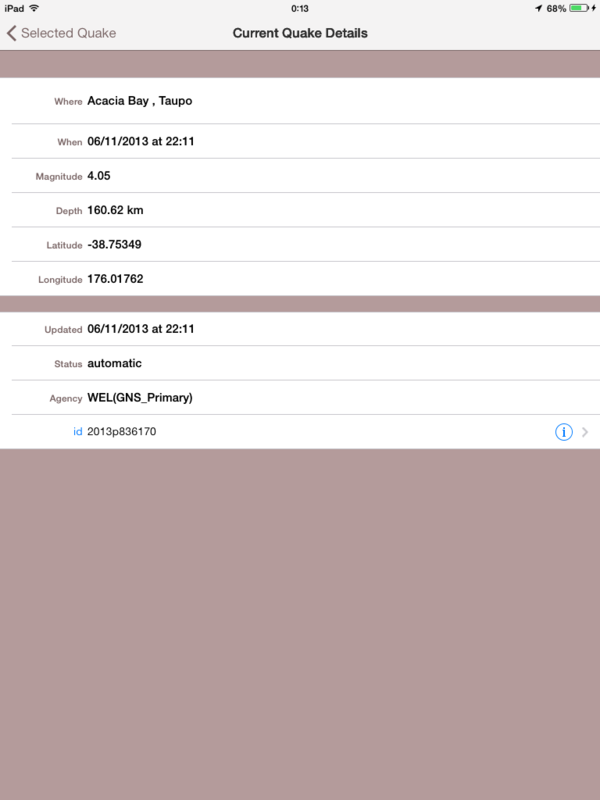 If you want to have your location sent with the 'Help Message', or you only want 'Please Help (me)' requests to be triggered if the quake happens within a certain distance from you, or you want to see how far you are from the quakes, or you want to be able to search for quakes within a given distance from you, ensure 'Enable Location Updates' is on. Note that when 'Enable Location Updates' is switched on, the 'Check Now' button and 'Distance To Quake' section become enabled. For the purpose of this demonstration, turn 'Enable Location Updates' on. Scroll dwn to 'Distance To Quake' section and select the 'Any' option. This will mean that no filtering will be applied to the primary feeds quakes by Terris when determining whether to trigger the 'Please Help (me)' request. 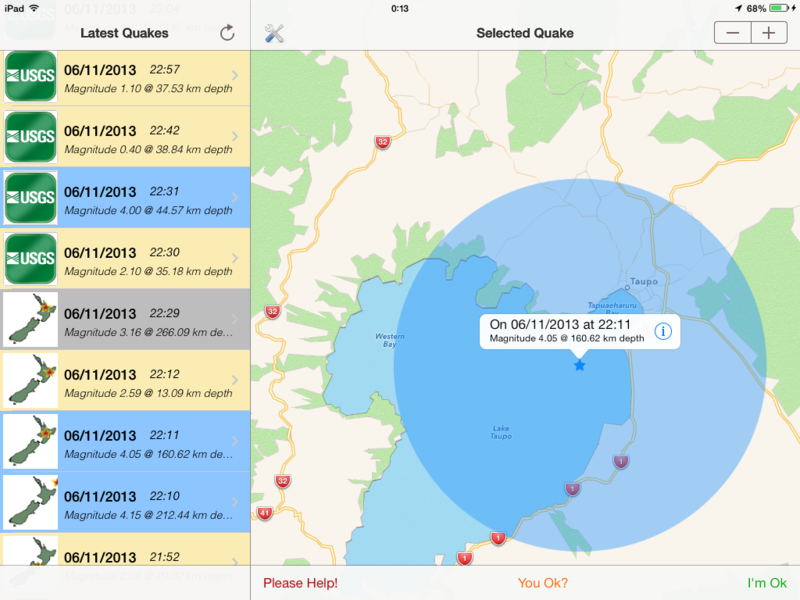 Navigate back to the 'Latest Quakes' screen. Crank the device's volume up to max. Wait for a quake on your primary feed. Fix bug with initial setup wizard whereby notification information is not populated correctly from address book. Update base iOS from 6.0 to 8.0. Fix bug with location services caused by changing iOS versions. Modify 'Settings' -> 'Setup Notifications' -> 'Enable Location Updates' -> 'Check Now' so that the user's current location is displayed on map. Fix bug whereby 'Filter by date' end date defaults to 31/12/2014, meaning no 'quakes will display until the user selects 'Filter'-> 'Reset'. Fixes for bugs caused by changing iOS versions. Improvements to search screen, including allowing the user enter the location they wish to filter on (e.g. 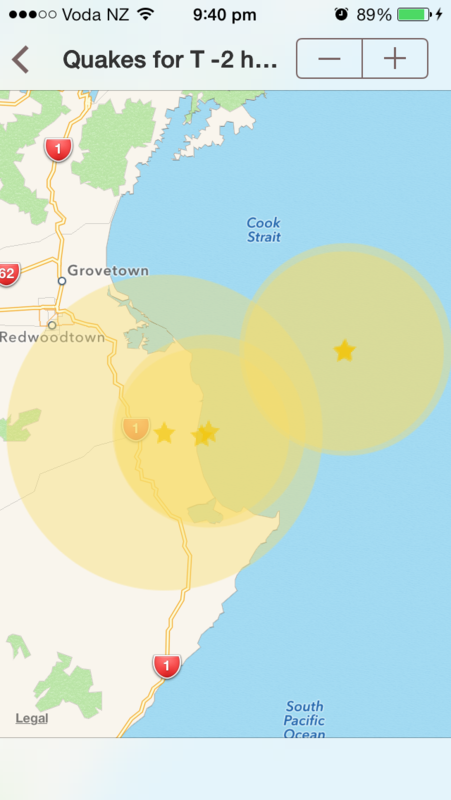 if a loved one happens to be visiting a quake hotspot one may be more interested in quakes occuring in their location as opposed to one's own). The ability to download missed earthquakes from any of the feeds for a given day. Increased offline storage for up to 500,000 quakes. Add Japan Meteorological Ageny feed (experimental). 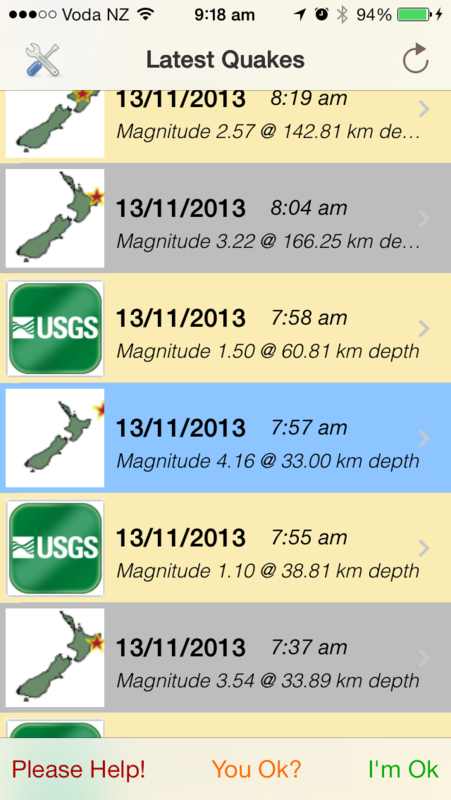 Add pull down - release to refresh 'Latest Quakes' screen. Allow user to email suggestions for additional features / improvements via settings menu. 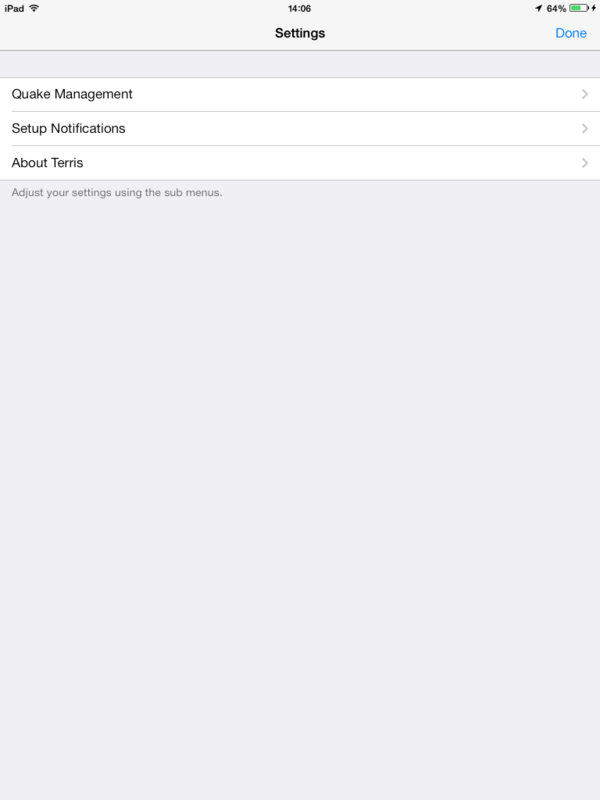 Link to allow the user to rate the app via settings menu. Add European-Mediterranean Seismological Centre feed (experimental). Add British Geological Survey feed (experimental). Display the users current location on the map if location services are enabled. Modify the ‘Please Help’ SMS/Email sequence so as not to trigger the ‘I’m Ok’ sequence. Tidy up data model a little. Remove experimental USGS monthly feed as being to flaky. Fix email address lookup bug. Make location manager more robust. Increased offline storage for up to 100,000 quakes. 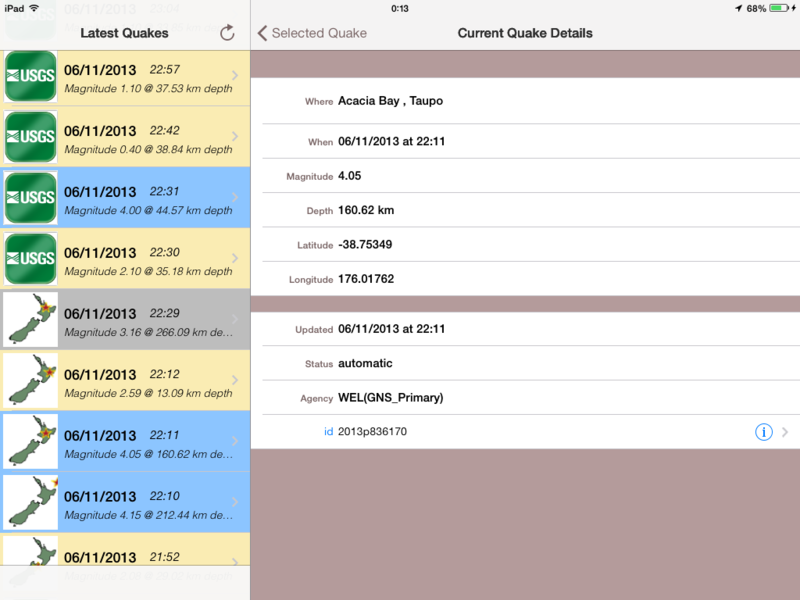 Advanced quake search functionality (by quake feed, magnitude, depth, date and distance). Add notion of 'Distance to quake' to the notification process (i.e. 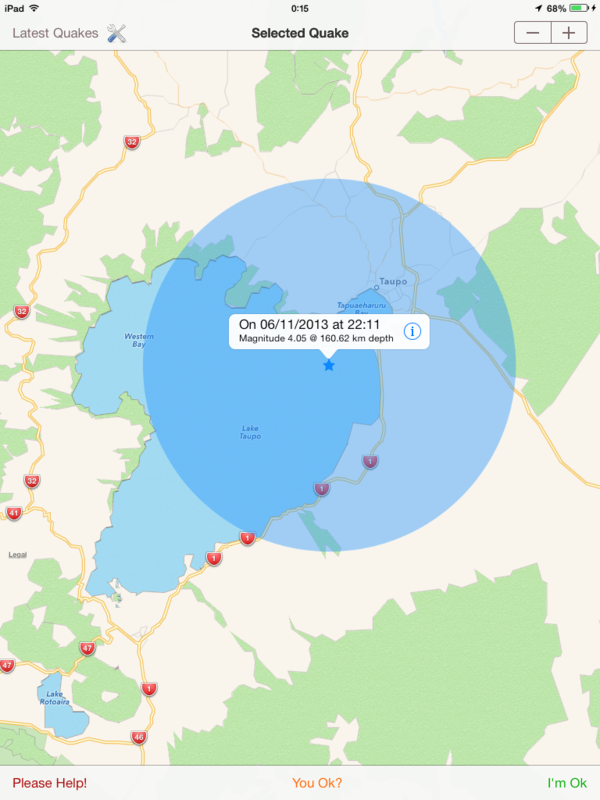 only trigger the notification process if the user's current location is within the selected distance of the quake). Ability to download the previous months quakes from the USGS (experimental). Automatically select (display) the annotation on the map when the user selects a quake from the list of latest quakes. Allow address book to be used to add contacts. Tidy up startup wizard and settings menus. Fix USGS feed depth bug. Fix issue where no secondary feeds would be loaded if USGS was primary feed. Alter sequence of quake display from: quake list -> individual details -> quake map to: quake list -> quake map -> individual details ( -> display on origin site). Add 'splat factor' (aka strength) overlay to quake map annotation. New (Are) 'You Ok?' notification option. Motivation for this was all the non New Zealand downloads, which implies that while the user may not be in New Zealand, someone they care about is. New U.S. Geological survey feed. New notion of a 'primary' feed that drives the notification process. Current options are 'GNS' (New Zealand) and 'USGS'. Ability to filter on quake magnitude via Settings menu (Settings -> Quake Management -> Filter Quakes) or by pinch gestures on quake list screen. Update to run on iOS 7. Pin drops on maps modified in shape and colour. Pin drops only visible for 24 hours in the maps's timeline, to avoid clutter.